A visit to our local bird aviary always makes a great excuse for a new bird craft! At our recent visit we got up close and personal with some peacocks that roam freely around the aviary and it was a blast. 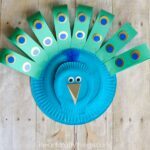 We used them as our inspiration to create this yarn weaved paper plate peacock craft. Not only does the yarn weaving add awesome texture to the craft but it is also great for building fine motor muscles which makes it a perfect craft for preschoolers. *We received our craft jewels from our friends at Craftprojectideas.com. All opinions expressed are my own. You can find them at your local Walmart on the craft aisle. 1. Gather your supplies. Cut the bottom of your heavy duty paper plate off so you have a straight line. 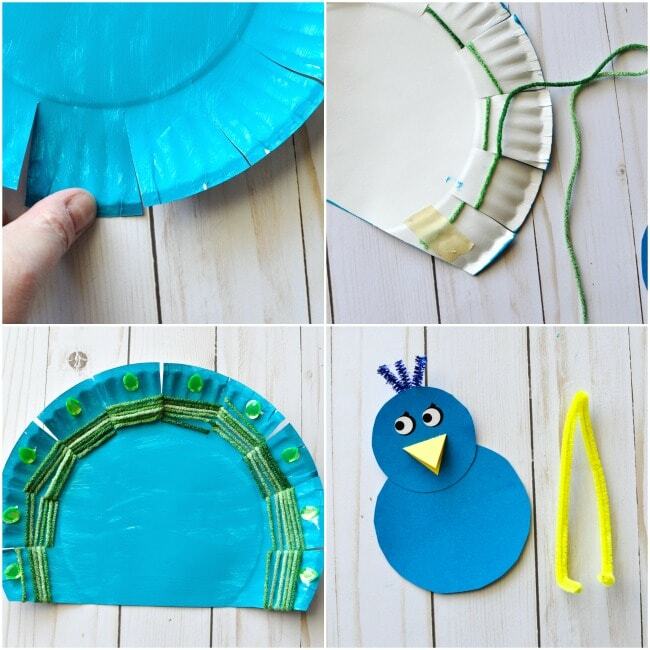 Paint the front of the paper plate with your turquoise paint. Set it aside to dry completely. 2. 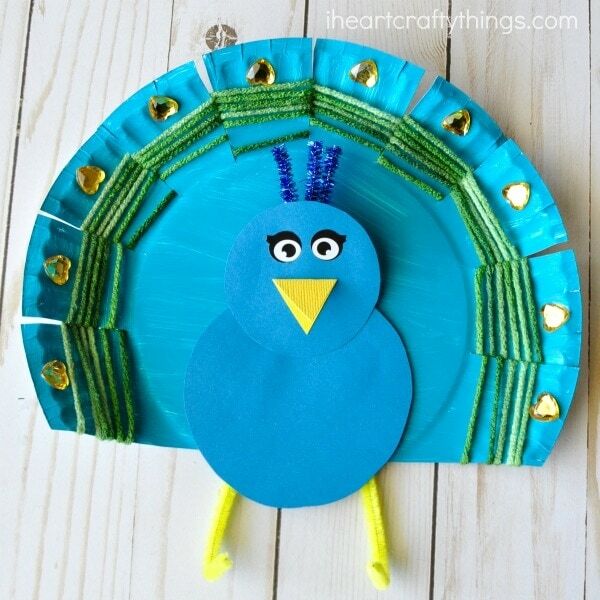 Cut out two blue circles for your peacock head and body. Then cut out a yellow beak for your peacock. 3. Once the paint on your paper plate is dry, cut slits around the rim of the paper plate about every 1 1/2 inches. 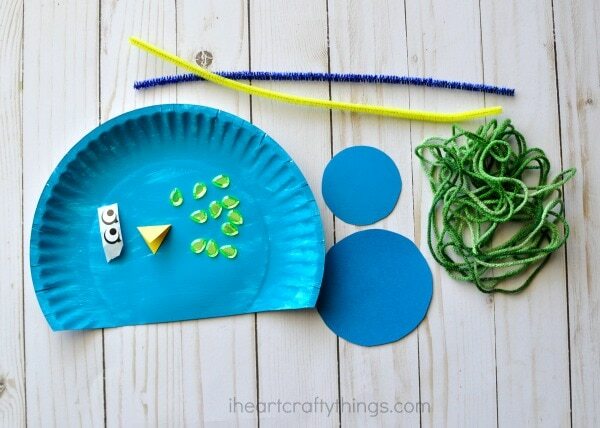 Cut off a large section of green yarn and tape it onto the back of your paper plate. 4. Weave the yarn in and out of the cut paper plate sections making several layers up the paper plate. 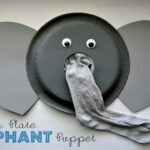 When you reach the end of your yarn, tape it onto the back of your paper plate. 5. Glue colorful acrylic jewels around the rim of the painted paper plate. 6. Glue your blue peacock head onto your blue peacock body. Then glue your yellow beak onto the face and add some googly eyes stickers. 7. 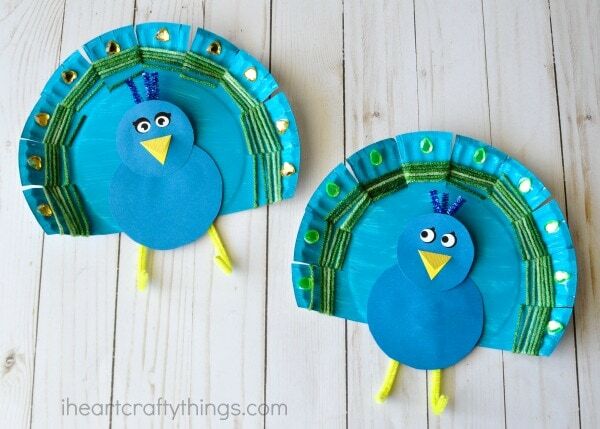 Cut off three small pieces of your blue shimmer stick and tape them onto the back of the peacock head. Now fold your yellow pipe cleaner in half and fold down the ends on each side to make peacock feet. 8. 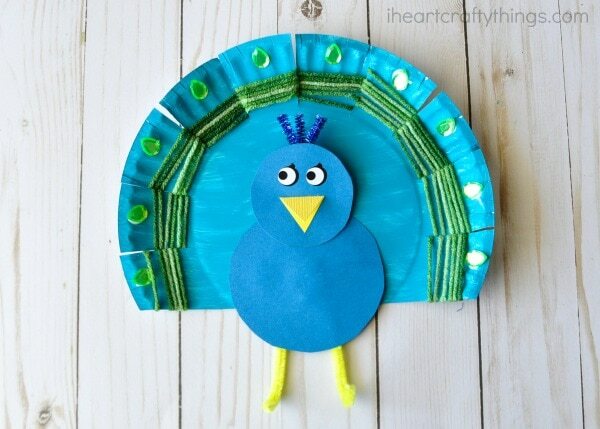 Finish your yarn weaved paper plate peacock craft by gluing the body onto the front of the paper plate and then tape the legs onto the back of the paper plate. Looking for more bird fun? 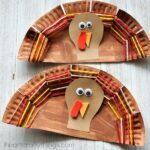 Check out these 11 awesome bird crafts that are perfect year round! 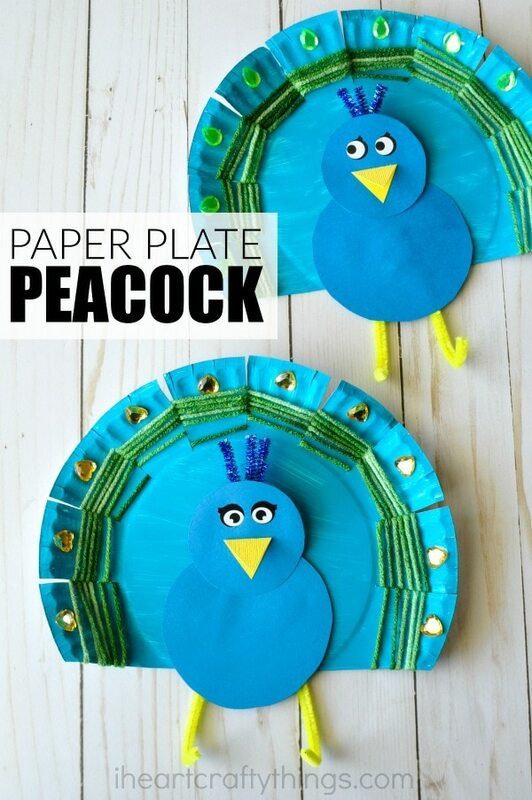 You might also enjoy our 20+ paper plate animal crafts.